What do rabbits really need? What are the basics, anyway? Ask ten breeders and you might get ten different answers, but here are mine. It is my opinion that water is the most important of the basics. A clean, consistent water supply is essential to general health and good condition. I believe the water should be consistent both in its availability and in its quality. That is, giving well water one week, and chlorinated water the next, and filtered the next is not consistent in quality. The water will vary in bacteria, chemicals, and minerals. A Holland needs about 1/2 cup of water per day. So I make sure they have at least one cup per adult rabbit. I have an automatic watering system, but I am liberal in the use of crocks as well. Since I recently wrote about water in detail, I’ll not expound any further. Although it is possible to raise rabbits on vegetables and complex, varied diets, the basics would be pelleted feed. I think that Hollands thrive best on lower protein feeds. I have used a 16% feed with satisfaction. I now use a higher level protein, but unlimited hay and probiotics plus no carbohydrate treats make that work, in my opinion. It’s very easy to push a Holland on a high protein feed over the edge into enteritis or other problems otherwise. It is extremely important that you feed the correct amount of feed. Non-lactating adult rabbits should never be free-fed, in my opinion. That leads to an excess of cecal matter and an imbalance in the hind gut. But neither should rabbits be underfed. Read the recommendation by the maker of your feed. Feed amounts are generally given in ounces by weight. That means you need to weigh your feed! I think that generally 3 oz. of feed is appropriate for a Holland lop. But that might be 1/3 cup in one brand, 1/2 cup in another, and, as it is with the extruded feed I use, 3/4 cup! If you feed a lower protein diet and don’t give carbohydrate treats or conditioners, you might get away with feeding little or not hay. I say “might” because you’ll never know until you start losing rabbits. It’s not worth the risk to me. I do think that the higher your protein level or the larger the proportion of carbohydrate treats in the rabbit’s diet, the more they need their hay. Rabbits need a high fiber, relatively low protein, low fat, low carbohydrate diet. Hay fits that profile perfectly. Protection from wind can come from being inside a house or barn or from being covered with a tarp. I’ve read that one solid side and a top are sufficient. I think that two adjoining solid sides is better; it gives them a corner to snuggle into. Rabbits inside a barn may still be in a drafty place. That might be great in the summer. They’ll love the air movement then. But in the cold, that can cause a problem. A draft reduces the rabbit’s ability to conserve its own body heat. You can stop the draft, move the cage, or give the rabbit a small enclosure where it can go to get out of the draft. Rabbits cannot maintain their body head efficiently if they are wet. While a mild mist in very hot weather is unlikely to cause a problem, being damp in the winter is deadly. A rabbit exposed to direct sunlight with no place to get into the shade can die on a relatively cool day. It doesn’t need to be 95 degrees to be a problem. Take sun exposure very seriously and give all of your rabbits shade. Visitors to my barn are often concerned about the weather being too cold for their rabbits. Their concern is totally misplaced. As long as the rabbit is dry, out of a draft, and has some way to conserve body heat, it doesn’t get too cold in most places in the US for that to be a real concern. But almost every place in the US gets hot enough to kill a rabbit. Heat is the much bigger enemy. Fans, misters, swamp coolers, ice packs, and large crocks of icy water can all be used to help your rabbit stay cool. We place the sprinkler on top of the barn on hot days in the summer and that cools things down a few degrees. I used to think that raccoons were so cute – that is, until I learned that they will reach those cute little hands right into a nest box and steal away my kits! Cats, dogs, raccoons, snakes, rats, and much more would love to get their paws, teeth, or scales on your bunnies. And animals such as dogs need not even touch your rabbits to kill them. Don’t wait until you’ve lost rabbits or your rabbits have lost toes to fence your hutch area or to block the entrances to your barn. I personally need to take this advice and reinforce the rocks around the base of the barn, which are there to discourage animals from digging under the barn walls. The windows are covered with hardware cloth. So far, this has worked well for me. Sudden noises and movements are tough to deal with. Rabbits can literally die of fright. 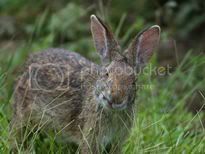 And, even more common, they can thump so hard that they injure or even break their backs. July 4 is one day I need to learn to anticipate. A radio tuned to 24 hours of talk radio would help muffle outside sounds. Otherwise, it’s just a matter of being aware. Working on the motorcycle just outside the barn is a bad idea. Teaching the children not to run or scream in the barn is a good idea. I must include clipping nails as one of the basics. Without it, a rabbit cannot stay healthy. Long nails change the way the rabbit uses his foot and shifts pressure. That can lead to sore hocks. Long nails are also more likely to be broken or torn out. As long as you attend to these basics, your rabbit can be healthy and content. Beyond these basics, grooming and petting, providing toys and time outside the cage, using conditioners and giving treats can round out your program and enhance your rabbit’s life. Perhaps you will stumble on a secret to giving your rabbits an edge on the show table. All of these extras are great. But they all depend on first providing the basics.